The Sculpture Gallery of the Municipal Art Gallery, Parnell Square, Dublin. This space, and those to the immediate north, were added 1931-33 by City Architect Horace O’Rourke to what had originally been the first Earl of Charlemont’s town residence (designed c.1763 by Sir William Chambers). This is unquestionably O’Rourke’s finest contribution to the site: a double-height room with coved ceiling leading to a central glazed section, apsed ends to east and west, and screens of paired Doric columns to north and south. Beyond lie a sequence of interconnecting galleries reached through identical doorways of polished walnut. First I tried to get the things out of the study window – impossible opening from top – too high up – weight of presses – breadth of table – imposs – The men actually carried the who alcove mentioned through the hall – down the stairs – while every instant bucket men were ascending – how it was done Heaven knows – Honora and I carried out all my papers & Lovell’s – and my mother’s – letters – (pigeon holes) money accounts, books all laid on the grass before library window –my father’s picture on the veranda – all the library side of the hall pictures, Mr Dat etc. Extract from a letter of May 14th 1828 written by Maria Edgeworth to her half-sister Fanny and describing a fire that damaged but did not destroy the family home at Edgeworthstown, County Longford. Dating from 1791 and painted by Mrs Mary Powys the upper picture shows the house as it was after improvements carried out by Richard Lovell Edgeworth. The lower picture shows the same building in the late 1850s, some ten years after Maria Edgeworth’s death. The little bow window to the left gave light to her equally modest bedroom – but it fell off the wall some years later. Thankfully the greater part of the house still stands, although altered to serve as a nursing home. Both images and the letter are included in Maria Edgeworth’s Letters from Ireland most skilfully selected and edited by Valerie Pakenham, and just published by Lilliput Press. Anyone driving south-east from Durrow, County Laois on the N77 cannot fail to notice a striking ruin on a rise just outside the town. This is Knockatrina, yet another Irish house with unclear origins. The land here was owned by the Flower family, created Viscounts Ashbrook in 1751, whose main residence was nearby at Castle Durrow. The fifth Lord Ashbrook had three sons, the youngest of whom, Lt-Colonel Robert Flower is known to have been living in Knockatrina by the late 1860s following his marriage to Gertrude Hamilton: with no expectations of inheriting the main property, this would have been as much as he could expect to receive. And as the youngest of the family, he had to earn his living which he proved admirably capable of doing since he had a strong interest in engineering. He was responsible for a number of inventions, including a handloom for the unskilled and a latch-hook needle for faster weaving: these devices would be put to use by his neighbour the fifth Viscount de Vesci who in 1904 opened a carpet factory in Abbeyleix. Two years later Robert Flower became eighth Viscount Ashbrook, neither of his elder brothers having had male heirs (in 1877 the sixth Lord Ashbrook had divorced his wife Emily on the grounds of adultery with a Captain Hugh Sydney Baillie). As a result he came into possession of Castle Durrow but by that time the family finances were in poor condition and three years after his death in 1919 the ninth viscount was obliged to sell Castle Durrow. Knockatrina was inherited by the eighth Lord Ashbrook’s eldest daughter the Hon Frances Mary Flower who in 1893 married Henry White, the younger son of a neighbour. As early as 1908 she and her husband were in trouble for failure to pay debts yet somehow they managed to hang on. Following her husband’s death in 1923, Frances White continued to farm and train horses, despite being declared bankrupt in 1928. It was only in 1946 that she finally moved out of Knockatrina and into a nursing home in Kilkenny where she died the following year aged eighty. Knockatrina meanwhile had been bought by Mary Mooney who acted as housekeeper and companion to another local woman, Amy Mercier (Mary Mooney would be the beneficiary of the latter’s will). It seems Ms Mooney acquired Knockatrina as an investment rather than a residence since in 1958 her agent, a farmer in the vicinity, arranged to have the house stripped of all removable fittings and unroofed (this was the period when any such building with a roof was liable to domestic rates, hence many of them had the slates removed). Left a shell, Knockatrina quickly deteriorated and the land on which the remains stand was subsequently sold. As is so often the case, no records appear to exist offering information about when Knockatrina was built or who might have been its architect. It has been proposed that Robert Flower was responsible for the house’s construction but this seems unlikely, not least because by the time he moved there the family was already burdened by debt. More importantly, on the basis of design it looks to belong to the group of medium-sized country houses including Rathwade, Wykeham and Mount Leinster Lodge. There were all in nearby County Carlow and built during the 1830s to the designs of the prolific (and – like the Flowers – permanently indebted) Daniel Robertson in a loosely Tudor Gothic style. If Knockatrina belongs to the same group, and indeed was designed or inspired by the same architect, this means it would have been erected during the lifetime of the fourth Viscount Ashbrook, whose first wife Deborah Friend was a considerable heiress. Given its proximity to Castle Durrow, Knockatrina would then have served as either a dower house or an agent’s residence. However neither would have been required by the late 1860s, so handing it on to a younger son made sense. Inevitably given that the house has been unroofed for almost sixty years almost nothing of the interior survives (other than some tiles on the entrance hall floor). Fortunately, as can be seen in the photographs above, the present owner does not wish for the building to fall into further disrepair. On the contrary, he is keen to undertake a programme of restoration over the coming years and return Knockatrina to residential use. All being well it won’t be long before the view from the N77 offers passers-by not a ruin but once again a fully functioning house. The difference a few months can make: the north lodge at Ardbraccan, County Meath in high summer (above) and now (below). In recent years there has been some discussion about when the Franciscan Order first arrived in Ireland. A long-standing tradition had it that the earliest friars here established a house in Youghal, County Cork in 1214 (twelve years before the death of Francis of Assisi). However, the earliest contemporaneous account of an Irish Franciscan house dates from 1233, and refers to a property in Dublin which was evidently well-established by then since mention is made of the need to repair a church and house. Whatever the facts, the Franciscans proved highly popular and over the course of the thirteenth century, some 45 friaries had been set up across the country, usually at the behest – and with the funding – of an important local family. Such was the case with the house at Ardfert, County Kerry established in 1253 by Thomas FitzMaurice who would be buried in the church close to the altar following his death in c.1280. The remains of Ardfry Friary indicate it was a substantial building. The wide body of the church concludes in a five-lancet window. As was usual with mendicant houses, the church had no side aisles but in the 15th century a transept was added on the southern side. This has a handsome nine-lancet window removed from the building in 1670 and installed in nearby Ardfert Cathedral before being returned to its original location in the second decade of the 19th century. To the north of the church lie the remains of the cloister, only the eastern side being still intact. In the 15th century a six-storey tower was added to the complex at the western end of the church, presumably to provide secure accommodation for the friars during a period of considerable internal turmoil when even religious establishments were not safe from attack. Ultimately, like all other such houses, Ardfert Friary was closed down in the 16th century, after which it passed into the control of Colonel John Zouche, an English soldier at the time based in Munster. By the 1630s the property had passed into the possession of the Crosbie family with whom it remained until the last century. Ardfert Friary today stands in the middle of what was once a landscaped park, with the religious house serving as a romantic ruin. It is hard to appreciate this now because the former Crosbie residence has gone. The family, originally called Mac an Chrosáin, were bards in Laois who in the 16th century moved to Kerry. There Sean Mac an Chrosáin changed his name to John Crosbie, converted to Anglicanism and in 1601 became Church of Ireland Bishop of Ardfert. It was his descendants who occupied the site of the old friary and who towards the end of the 17th century built themselves a new residence, named Ardfert Abbey. Surviving photographs give an idea of what the building looked like with the main block, its breakfront centre pedimented, flanked by two ranges that came forward to create an open forecourt (further outbuildings ran on either side). Internally the most striking room was the hall, its panelling painted in monochrome with a series of classical figures running around the walls. But there was also a fine early-18th century staircase and handsome early classical reception rooms. 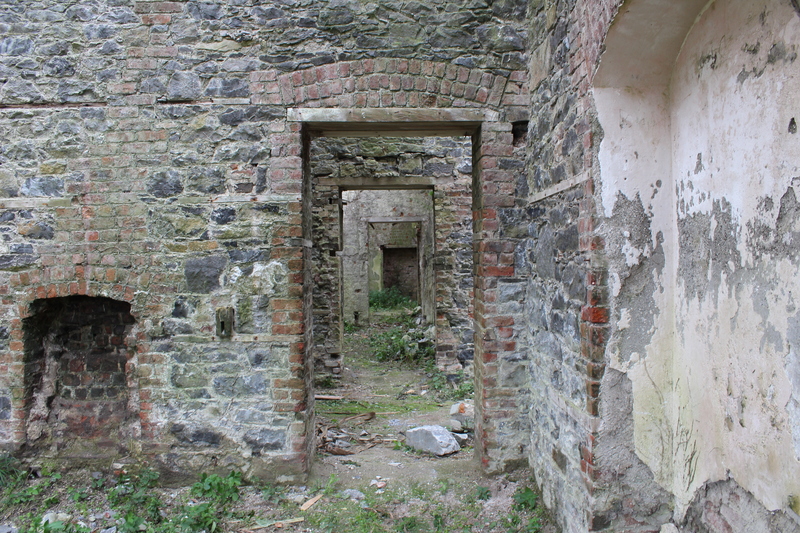 All survived intact until Ardfert Abbey was burnt in August 1922, the remains being subsequently demolished. As a result, visitors to the friary today only see part of the site’s history and can easily misread the setting in which the building stands. An important part of Ardfert’s history has been forever swept away so that what now remains tells only part of the tale. A view of the south front of St Carthage’s Cathedral, Lismore, County Waterford drawn by Jonas Blaymire and engraved by J Haydon in 1739. At that date the building still assumed the appearance given after an extensive programme of restoration work undertaken by Sir William Robinson from 1769 onward. Robinson rightly features prominently in A Biographical Dictionary of Architects in Ireland 1600-1720 published in 1981. Sadly its author, Rolf Loeber, who thanks to the Hon Desmond Guinness was able to live in Castletown, County Kildare during the book’s preparation, died in Pittsburgh earlier this week. Although a distinguished professor of psychiatry and psychology, Loeber had a life-long passion for Ireland’s architectural history, first inspired when as a student in Amsterdam in the 1960s he had read a copy of Maurice Craig’s Dublin 1660-1860. Beginning with an article on Irish Country Houses and Castles of the Late Caroline Period: An Unremembered Past Recaptured (Bulletin of the Irish Georgian Society XVI, 1973), he published extensively on the subject, often breaking fresh ground and often in collaboration with his wife Magda (together they produced A Guide to Irish Fiction, 1650-1900 which appeared in 2006). His knowledge and passion will be much missed by everyone interested in Ireland’s built heritage. Inside Christ Church, Ballymartle, County Cork dates from 1866 when it replaced an earlier building, the ruins of which can be seen close by. Several funerary monuments were moved from the latter, including this touching memorial to William Meade erected by his parents, Sir John Meade and his wife the Hon Elizabeth Butler, a daughter of the second Viscount Ikerrin: their grandson, also called John, would be created first Earl of Clanwilliam in 1776. But William had long since departed this world since, as the inscription notes, having been born in 1689 he died in 1702, less than a fortnight before what would have been his thirteenth birthday.